This bundle is a full set of On Target’s Gray Cook videos, and is a fabulous way to get caught up with all of Gray’s current thinking. If you order 3 or more items, a 10% discount will apply. If you order 5 or more, that discount will be increased to 20%. If you order 7 or more, the discount goes up to 30%. 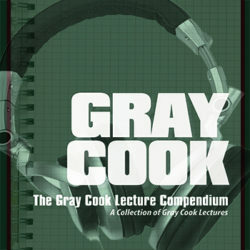 This bundle is a discounted collection of On Target’s Gray Cook videos, and is a fabulous way to get caught up with all of Gray’s current thinking. It’s a mix of both digital and physical items, and you can order either or both editions. You can choose all or some of the elements above.